Hello! I'm back to share a couple more of my backlogged cards. This time I'm posting a couple of La-La-Land Crafts ones. 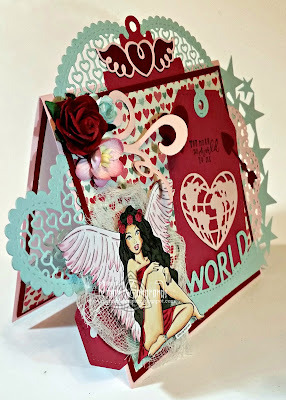 Anyone who has visited my blog on occasion most likely knows how obsessed with their dies I am! I LOVE them! I also adore their Luka and Marci images, though I don't seem to use them as often as I should. Below I'm sharing a card with each character. The first card features Cupcake Princess Marci. 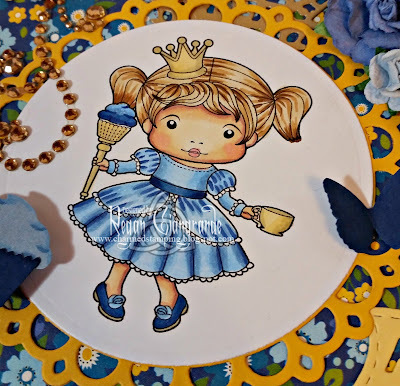 She is colored with Copics, cut using Classic Circles Nestabilities (Spellbinders), and matted with Picot Circles Nestabilities (Spellbinders). The rest of the dies are from my LLLC collection. 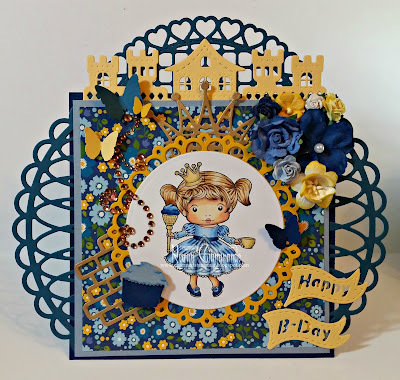 I've used Open Hearts Doily Border, Castle Border, Bricks, Loopy Doily, Filigree Crown, and Birthday Flag. The butterflies and cupcake are Martha Stewart punches. I added some flowers and a bling flourish. For the second card, I've used Football Luka. 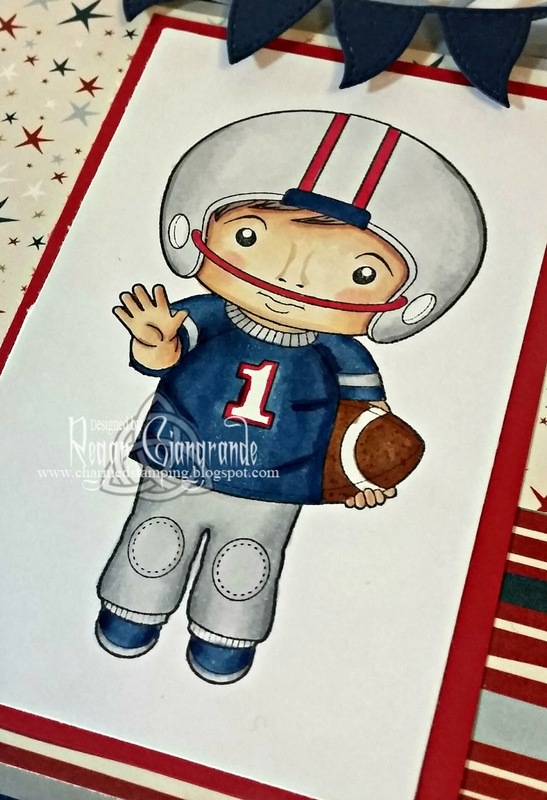 He is colored up in New England Patriots colors using my Copic markers. I'm not a sports fan, but the recipient is so this cutie was perfect. And since they're going to the Super Bowl this year, I guess they're kind of a big deal. Lol I continued the color theme with my papers and added a few dies. 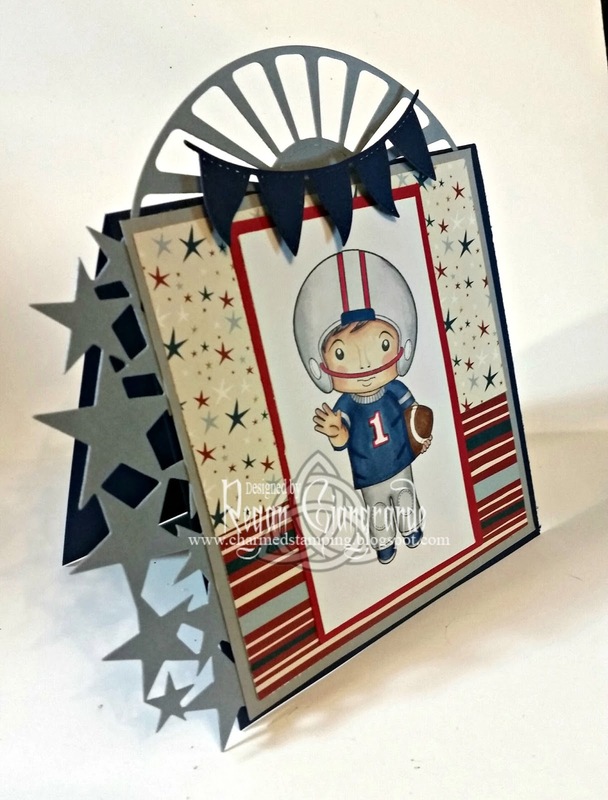 Flag Banner and Sunburst are both from La-La-Land Crafts. 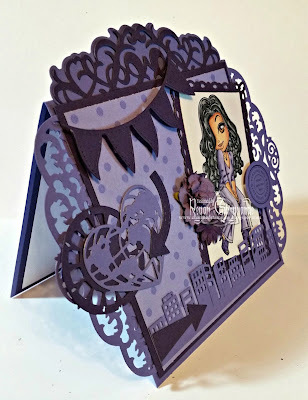 Star Cluster border is a Tim Holtz On the Edge die (Sizzix). Thanks again for dropping in! I hope you enjoy my creations! Have a lovely day! Today we celebrate! I have been on the KennyK Stamps design team for just over 3 years now. I couldn't feel luckier than to be able to work with this amazing team, and I cherish the friendships I have forged. That is why today KennyK's Krafty Krew is taking the time to wish our lovely leader. Elena, a very happy birthday! Join us over at Club KennyK for the full celebration, but I wanted to share my card with you here. Elena is one of a kind, and though we've yet to meet in person, we talk online pretty much every day. She is an amazing friend; so sweet and kind and generous! Fiery and feisty. Funny and fabulous. We decided that she deserved nothing less than a day of sunshine and rainbows! 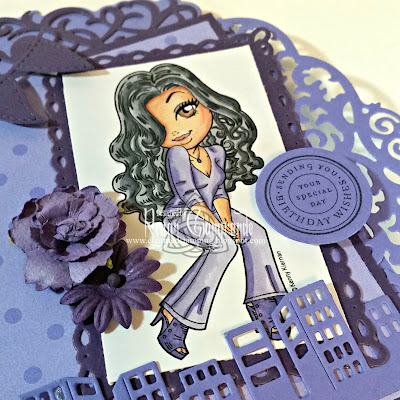 Each of the DT and GDT members created a monochromatic card in the color of their choice for Elena. I, of course, selected PURPLE as my color. I colored up Sweet Melissa with my Copics. Hair and skin tones were allowed as well, but I did her clothes all in purple. Then I piled on the dies! 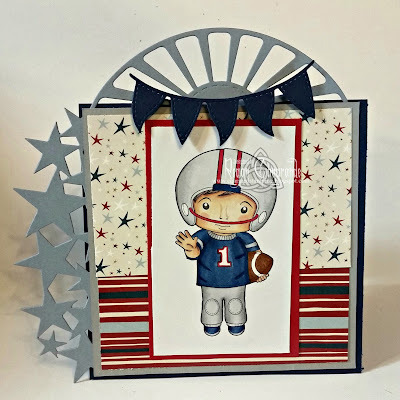 A majority are from La-La-Land Crafts: Filigree Border, Filigree Elements Border Set, Flag Banner, World Heart Map, Skyline Border, and Arrows, but I also used Romantic Rectangles and Classic Circles Nestabilities (Spellbinders) and View Master Doohickey (Magnolia). The sentiment is from Circle of Friendship (Stampin' Up). After all that, it only needed a couple flowers as a finishing touch. 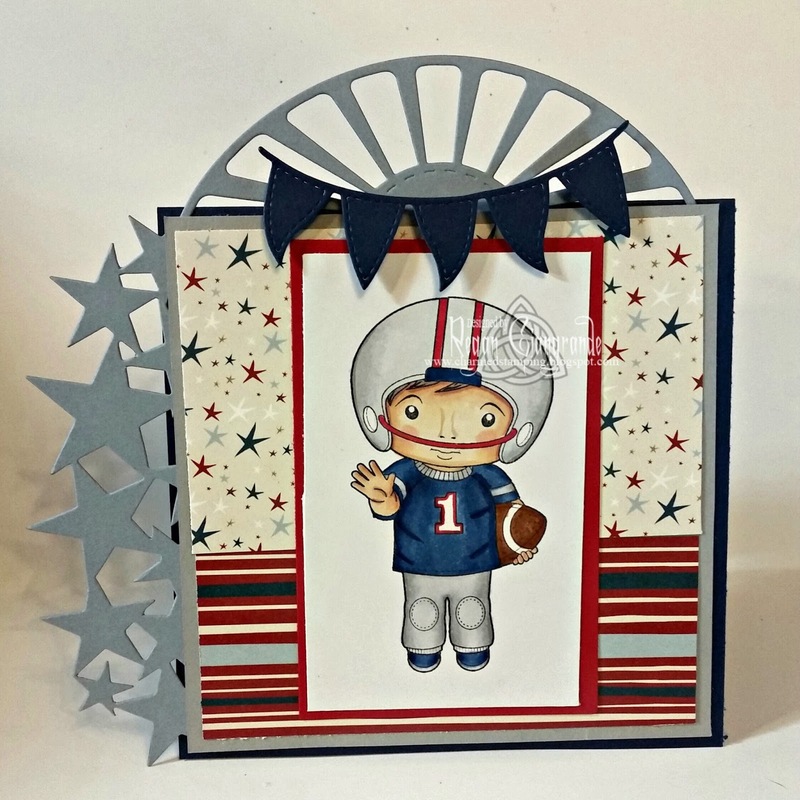 Thanks for stopping by for a peek at my card. If you'd like to see the full rainbow, visit us on Facebook at Club KennyK! Hi! Goodness, is January almost over already?!?! 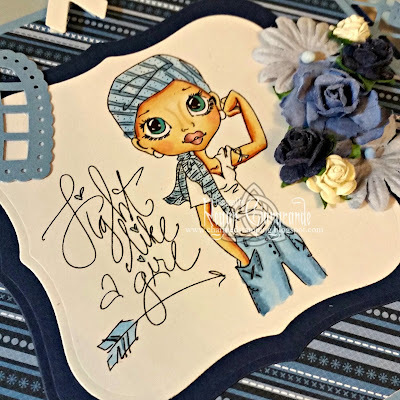 I have been crafting, I swear, but I've been horrible about blogging. Does anybody read these things anymore? Lol *taps mic* "Hello?" We have a snow/ice day today so I thought it might be a good day to take some time to show off a few creations. Kayne is busy playing Lego Dimensions on his Xbox (which is so cool because it is Lego building AND video game playing all in one) so he's occupied and I have a little "me" time. Both of these Saturated Canary cards were made in December. One was for my friend battling lung cancer and the other was a holiday card for my son's teacher. I'm still mourning the closing of the SC shop, but at least I have my subscription to get me through the rest of the year. For my friend, I colored up Ribbons with my Copics. 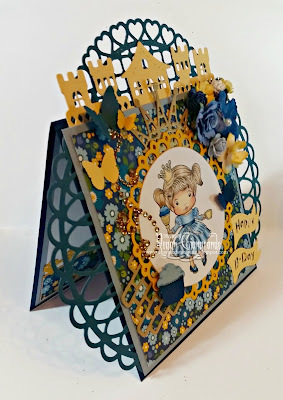 She is cut and matted with Labels One Nestabilities (Spellbinders). As per usual, I have layered up lots of dies around her. 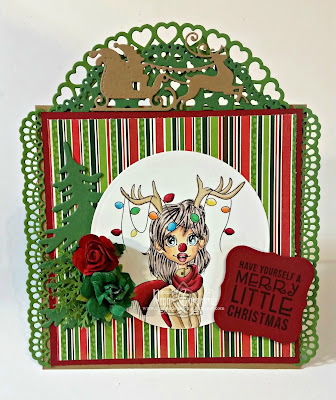 Most are from La-La-Land Crafts: Lattice Border Doily, Heart Doily, and Heart Doily Border. The Awareness Ribbon is from QuicKutz. The small lattice heart is a Martha Stewart punch. Some flowers and a few pearls finish off the card. 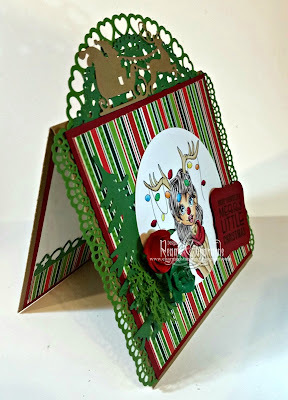 My second card features Oh Deer. She is also colored with Copics. 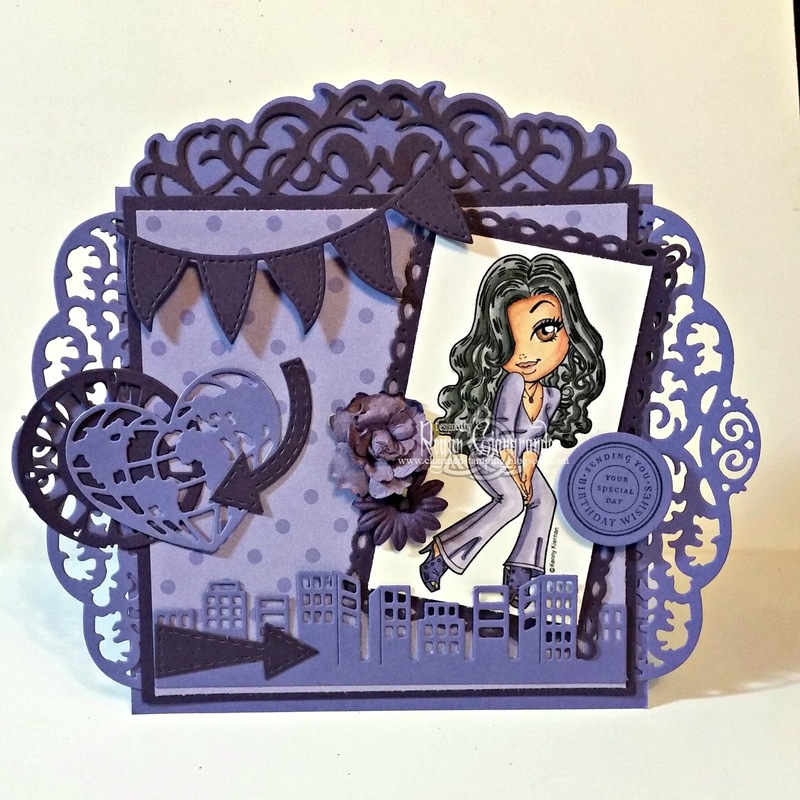 I cut her using Classic Circles Nestabilities (Spellbinders). 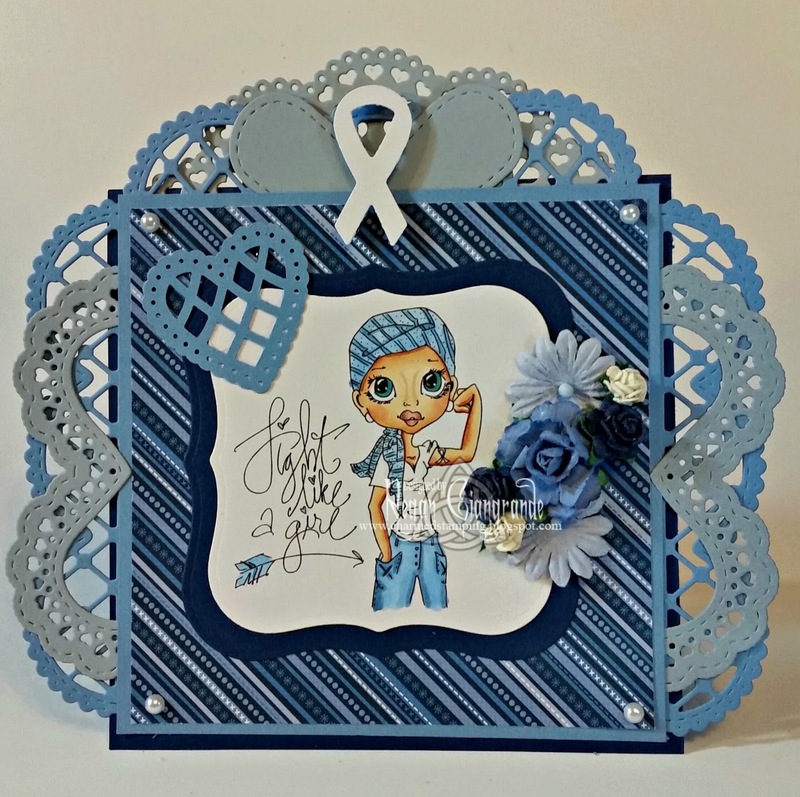 Once again La-La-Land Crafts dies take center stage. Here I've used Open Hearts Doily, Heart Doily Border, Christmas Tree, Santa Sleigh, and Small Lacy Border. The branches are a Martha Stewart punch. 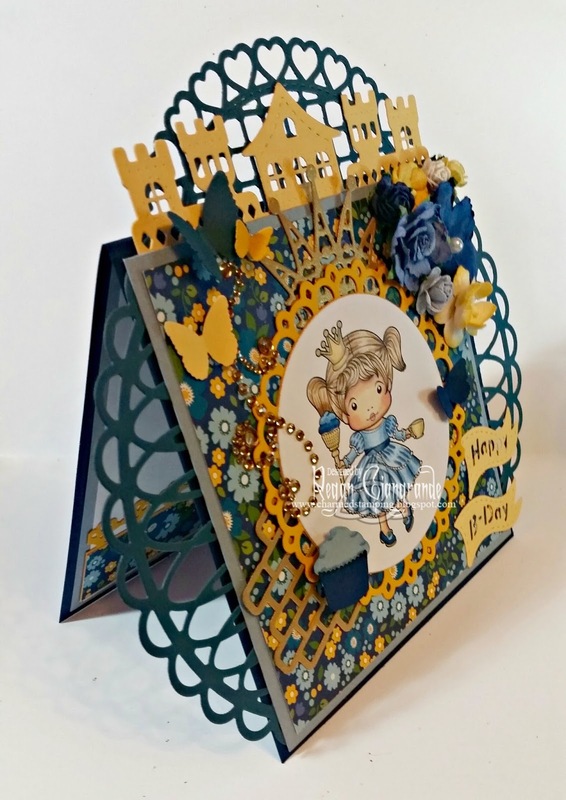 I added a couple of flowers and a stamped sentiment cut using Labels One Nestabilities (Spellbinders). I have more cards to share and hopefully I will find time to post again soon. In the meantime, I'm off to shovel. Happy 2017! I'm afraid I've been quiet for a couple of months as the holidays created a flurry of festive activity around us, but now that we are halfway into January it is time to ease back in to things. 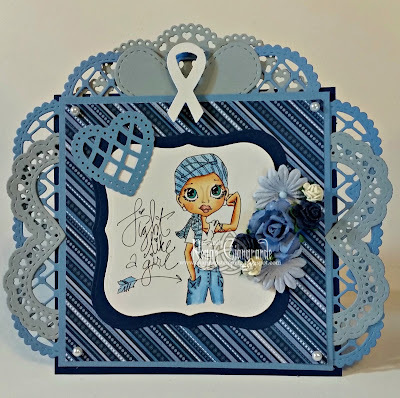 I have been crafting, just not posting, and you will see me play catch up on my blog shortly. Before I do that, though, I'm here to share my first creation of 2017! 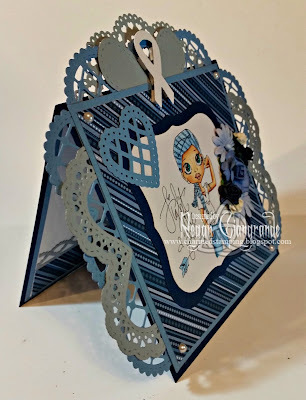 And of course it's a KennyK Stamps one! We have made some adjustments and revamped things for the new year! All of the fun changes are coming February 1st, but in the meantime the design team, KennyK's Krafty Krew, wanted to sort of reintroduce ourselves to our fans. To give our posts a coherent feel, we selected a theme to follow. This time of year what could be more appropriate than in with the *NEW*. 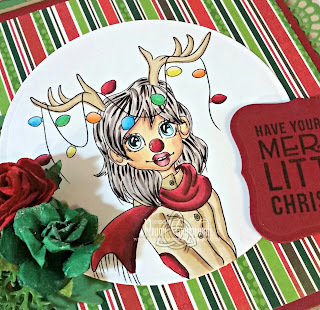 I selected an image that I have never colored before (so therefore it's new to me) and used quite a few of the new dies I received for Christmas. Angel Aurora was colored with Copics with the exception of her hair. There I used a black Wink of Stella pen to give her hair a glistening ethereal feel. She is fussy cut and popped up on foam squares on top of a gauzy piece of cheesecloth. Almost all of the dies are from La-La-Land Crafts. 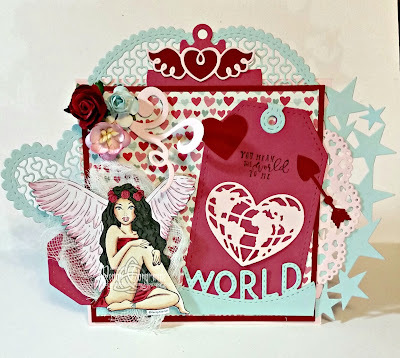 I've used Stitched Tags, Heart Arrows, Lacy Heart, Lacy Hearts Border, Winged Heart, World Map Heart, and World Border. 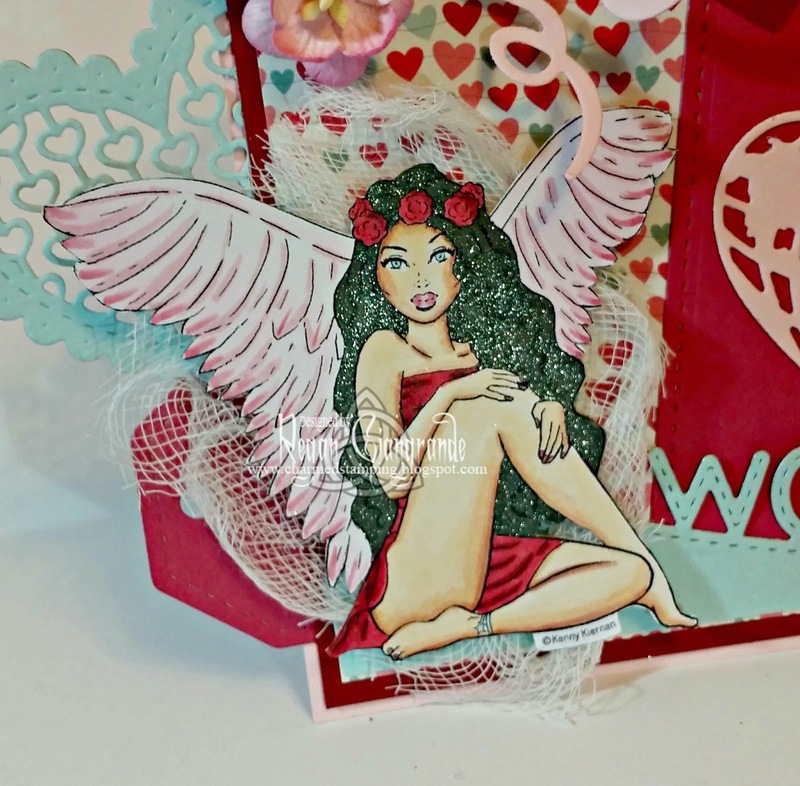 The flourish is from Sizzix. I've also used two Tim Holtz dies - Mini Clipboard Top and Star Cluster border. The sentiment is from the December La-La-Land Crafts Club Kit (as are the two World dies). A few flowers in the corner finished it off. Come visit at Club KennyK on Facebook!